From photos to thought-starters, everything you need to put together a successful story about Shred415 is right here. Looking for something specific? Email us at media@shred415.com and we’ll be happy to work with you. Bonnie Micheli and Tracy Roemer were just neighbors when they first met in Chicago in 2006. As young moms with similarly-aged children, they became fast friends, bonding over their shared love of fitness. The two had much in common; Tracy had over two decades of teaching and business management experience in large and small gym concepts, and Bonnie had a decade of teaching and management experience in the boutique fitness space, as well as a decade of fitness-related business experience. But there was one more thing that brought these two together: the lack of high-intensity training concepts that met their needs as busy parents. With no place to go for the sweat-inducing workout they craved, they decided to create their own—and in 2011, Shred415 was born. At just 60 minutes per class, it’s an efficient, effective, total-body workout designed to adapt to each individual’s goals, regardless of their current fitness level. 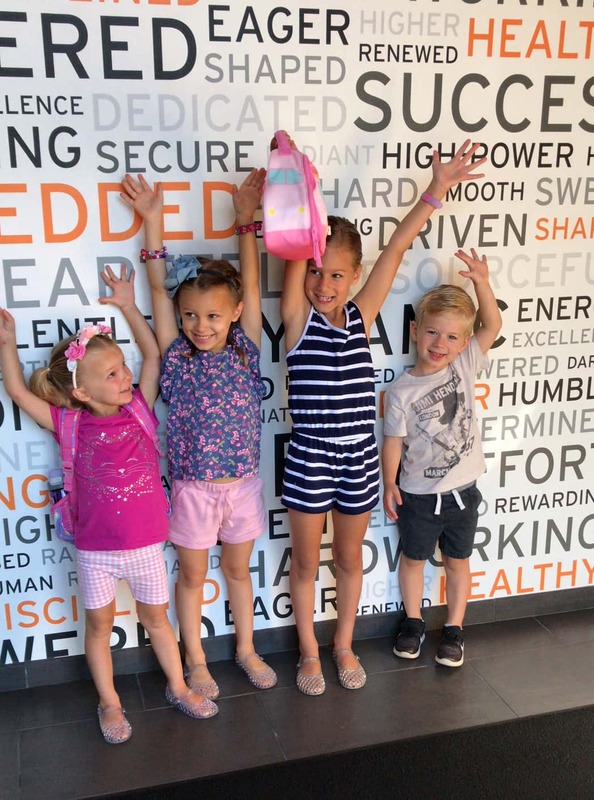 Parents with young ones can also rest easy knowing that every Shred415 studio offers childcare during select classes, making it easier than ever to get in a good sweat. Finding time to work out is tough—especially if you’re a parent. But what if we told you there’s a place that makes it just a little easier to squeeze in that much-needed sweat session? 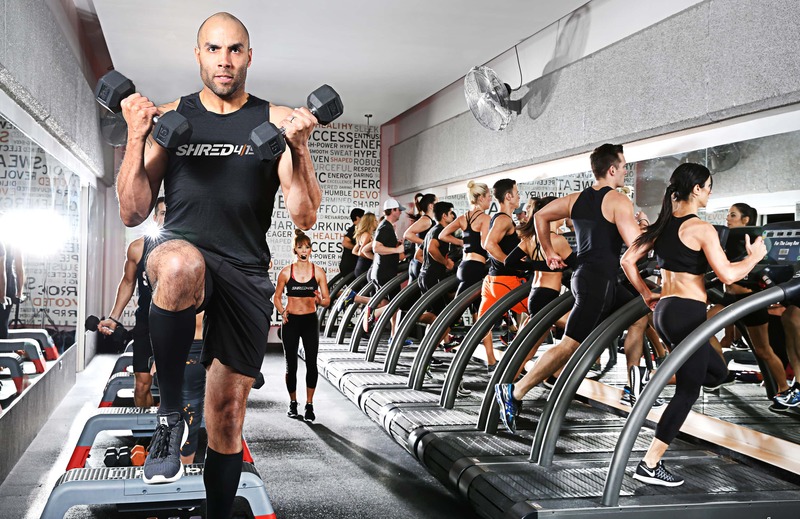 Enter Shred415, the high-intensity interval training concept that was created by busy parents, for busy parents. Every studio features the ShredKids Lounge, which offers childcare for kids ages 6 weeks to 13 years old. 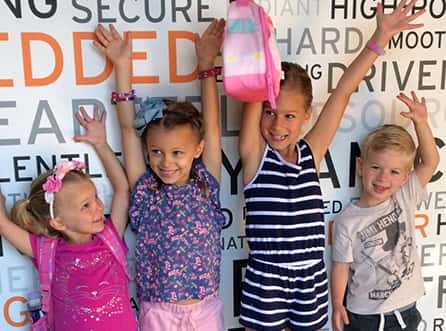 With trained childcare staff, a TV and entertainment system, and tons of books and toys, the ShredKids Lounge keeps kids entertained—and safe—so parents can get a worry-free workout. Say goodbye to one-size-fits all fitness. At Shred415, it’s all about staying true to what your body needs to reach that next level. How do they do it? Through the power of 415—four 15-minute intervals, that is. We’ve all been there before: new to the fitness scene, trying to find your way. Walking into that first class can be intimidating, especially when it feels like everyone already knows each other. Add on the uncertainty of what to expect in class (and whether you’ll be able to keep up) and you’ve got a recipe for serious self-doubt. Sound familiar? Kick those feelings to the curb, anxious one. 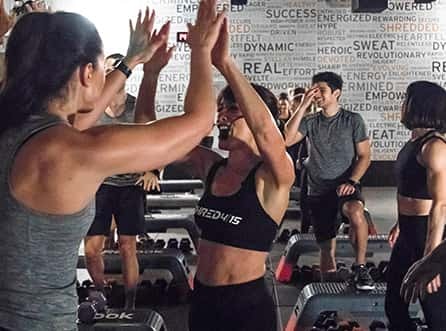 At Shred415, it’s a whole new world—one where you’ll find the support you need to reach (and maybe even surpass) your goals. Yes, the classes are intense and challenging. 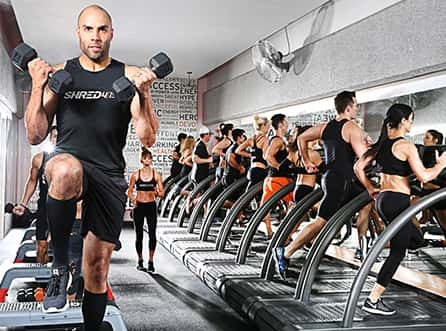 Shred415 is known for being an efficient, effective, and sweat-inducing experience. But it’s so much more than a workout; it’s a remarkable community of individuals who share a drive to not only better themselves, but to help others become their best selves, too. How did Shred415 manage to create such a strong sense of community in an industry that is known for its intimidation factor? Through simple human connection. 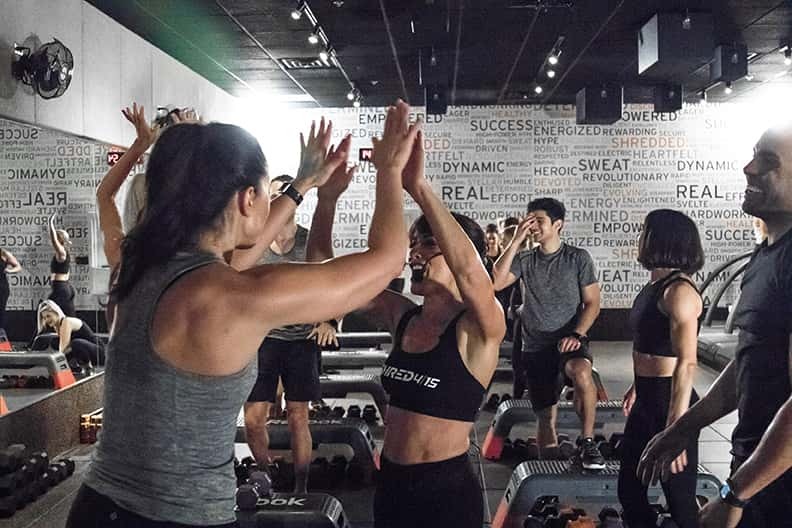 From their inspiring, motivating instructors to their family-friendly kids’ room, Shred415 has built something special: an environment that promotes camaraderie and support, no matter where you are in your life. This tight-knit community is one of a kind. Stop by on any given Saturday and you’ll likely notice something different: clients from all walks of life encouraging one another; instructors giving each person the attention they need; parents making plans to Shred together while play dates are made for their kids. It’s a pattern of supportiveness, and it’s just one of the many things Shred415 is known for. The Definitive Guide To The Most Popular Boutique Fitness Studios in the U.S.
Are Bonnie Micheli and Tracy Roemer the Next Jillian Michaels?